Pepper Reece, owner of the Seattle Spice Shop, thinks she can handle any kind of salty customer-until a murderer ends up in the mix . . .
After leaving a dicey marriage and losing a beloved job in a corporate crash, Pepper Reece has found a new zest for life running a busy spice and tea shop in Seattle's Pike Place Market. Her aromatic creations are the talk of the town, and everyone stops by for a cup of her refreshing spice tea, even other shopkeepers and Market regulars. 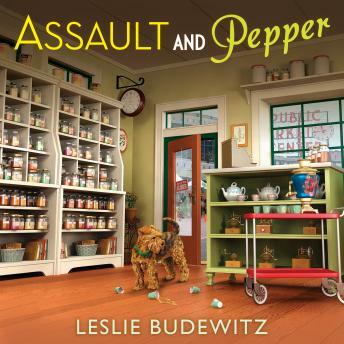 But when a panhandler named Doc shows up dead on the store's doorstep, a Seattle Spice Shop cup in his hand, the local gossip gets too hot for Pepper to handle-especially after the police arrest one of Pepper's staffers, Tory Finch, for murder. Tory seems to know why she's a suspect, but she refuses to do anything to curry favor with the cops. Convinced her reticent employee is innocent, Pepper takes it on herself to sniff out some clues. Only, if she's not careful, Pepper's nosy ways might make her next on the killer's list . . .